For a guy who makes a good portion of his living giving talks and training others to give talks, I was really terrible at giving talks when I was in university. I was probably bad in high school too but I don't remember ever being asked to do it. I wasn't afraid to raise my hand during class and ask a question or make a general observation about something from my seat but I don't remember having to speak in front of the class until university. Giving a presentation isn't like performing in a play or singing in a choir. You aren't playing a character and you aren't part of an ensemble. It's just you, as yourself, on the stage, in the spotlight, talking to a room full of people. I remember the presentation I gave during a marketing class in university that let me know I was not a good presenter. It was a group presentation, and like many university students we waited until the last minute to divide up our speaking responsibilities so I didn't have a lot of time to think about what I was going to say. I felt woefully unprepared and I'm sure it showed. When it was over and I sat down I couldn't remember anything that I had said. It was like temporary amnesia and that feeling stuck with me for a long time. I tell that story when I'm conducting presentation skills seminars now and talk about the hurricane in the brain. When I got my first teaching job at a small language school in South Korea in 1996, I remember feeling very nervous and completely unprepared once again. I had no teaching experience and my training had consisted of shadowing one of the other teachers in a couple of classes the day before. Looking back, she had been working with her students for a while and had already established a good rapport with them, so assuming that my new students would respond the same way to me as hers did to her was pretty unrealistic. In any case, before I walked into my first class I tried to give myself a little pep talk. I told myself three things that I thought were true. 1. I know more than they do about English. 2. This knowledge is something that they want, so it has value. 3. They came here to get my help. This helped me calm down and remind myself what was important. My job was to find ways to help them and give them what they wanted. When I gave my first conference presentation in 2005, I had already been a teacher for five years. (Yes, I know the math doesn't work. I went back home and tried some different things for a while.) There's something different about speaking to your students and speaking to your peers. It can feel like you are being judged in a way that you just don't feel when you're teaching. The power dynamic in the room is different, especially when there are more experienced teachers in the audience. But here's the thing, you should still know more about the topic you are speaking on that most of the people attending your talk. The content you are sharing needs to be useful to them and, thus, have some value. Finally, the people who attend conferences often come to take away a few ideas to use in their classes or to think about teaching in a slightly different way so, in essence, they are there to get some help. Keeping these three in the back of my mind has helped me become a more confident speaker and I find that it also helps my students brainstorm possible presentation topics. They need to ask themselves: 1. What do I know more about than my classmates? 2. Will it be interesting and/or useful for for them? 3. How can I convince them that it has value? They can then turn their answers into a complete introduction with a hook and once that has been done, sharing their content with confidence and enthusiasm gets a lot easier. Does Participation Constitute a Portion of Your Course’s Grade? Why Did I Include Participation? When I reflect back on my attitudes toward assessment early on in my career, I wanted the grade to include elements of both effort and ability. I am a strong proponent of students feeling like their grades were earned, not given. Thus, the grade would include criteria such as attending the classes, bringing the textbook and a writing instrument, utilizing my office hours, and participation during in-class activities to represent effort-based criteria. Exams, quizzes, writing assignments, group and solo projects, and any other productive output would be used to determine each student’s language ability or aptitude in the skill that is being taught through the second language such as essay writing or how to give a presentation. I am not including growth as a factor because it requires accurate pre-testing to determine each student’s level of familiarity with the course’s content as a starting point for the semester. When schools implement pre-course ability testing to attempt to create a level playing field for the students in the course or in the sections across the course, a new can of worms is opened. In theory, the students would now enter the course without having to compete with other students who have vastly different ability levels. The first potential problem is that this could only be achieved if prospective students who show proficiency in what the course aimed to teach are able to test out of the course while others who are not adequately prepared for the course would be required to take a remedial course first and this is not always the case. Another issue is that if course is divided into different sections and the students are grouped by ability level, the course should not be listed in the same way for higher level sections and lower level sections. Otherwise, a student who earns an A in a lower section of Course 101 would appear to be more impressive to a graduate school or potential employer than a student earning a B in a higher section of Course 101. This can lead to students purposely tanking the entrance exam to get into a lower level section in the hopes of getting an easy A. It should also be noted that I am assuming that the department does not have a mandatory grade curve in place. I am against curves because I don’t believe that grades should be based on intra-class competition but on meeting or surpassing the instructor’s expectations for what should be learned and experienced during the semester. I realize that the fear of grade inflation and instructors “giving” too many As in order to garner higher evaluations are reasons given for implementing grade curves but I feel that if the right educators are hired and departments do not put too much weight on student feedback, there is very little to actually fear. So, to get back to answering this section’s question, I included participation factors in my course’s grading criteria because I wanted all of the students in the course to be able to earn an A and I wanted both ability and effort to play a role. Would I Include a Participation Element Again? The simple answer is yes. However, I am assuming that the course in question is not lecture based and would have opportunities for the students to actually develop skills instead of only studying theory. If I was asked to teach a large, theory-based course that had out-of-class readings and then a lecture element, the grading would lean on traditional assessment criteria like multiple choice tests to determine if the students were absorbing the content. This would be appropriate for courses that have a large number of students and little to no productive requirements. In a course like that, I might not even choose to track attendance and use it as a grading criteria. They are university students after all and don’t have to be there. If a student can do the readings and pass the tests by borrowing lecture notes or attending study groups then good for them. 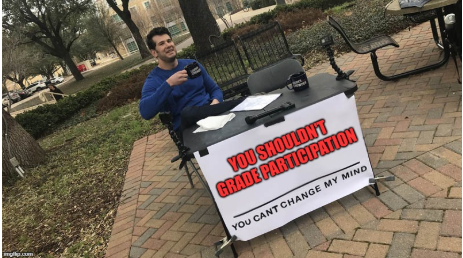 How Much of the Grade Should Be Designated for Participation? In the original syllabus that I mentioned at the beginning of the article, 10% was allocated to participation. I kept this over the years and deducted points each time a student was not prepared for class or did not participate at a satisfactory level (following a warning). I believe 10% is reasonable because it constitutes one full letter grade in a traditional 100-point scale. Students who work hard to meet the teacher’s expectations will get full participation points and their final grade will come down to how well they do on the tests and activities in the course. Students whose poor choices result in losing participation points will have a harder time earning a higher grade. Grading and assessment are complicated issues and sources of great debate among educators. When I began teaching, I didn’t question the syllabus that was given to me and the students didn’t complain about the grading elements, just the final grade itself. I have changed a lot as an educator but I still see the value of reserving 10% of the grade for participation. Change my mind. Yesterday was a fun day. I wrote a blog post about writing for language teaching magazines and it got a lot more attention online that my usual posts do. One of the best outcomes was a DM on Twitter asking for some advice on how to deal with impromptu business presentations for a student who is around B1 level and lacking confidence. I had been planning a post on this for a while but after yesterday's "success" and the nudge from the DM, I thought I'd write a little bit about it here. Passion can easily make up for a lack of accuracy in a second (or third, or fourth) language. I've seen it happen time and time again. That being said, I've also seen a lack of accuracy kill the passion that I know is there but the speaker is afraid to show it. I'll give you three examples. The first one comes from the IELTS exam. If you've never taken the IELTS exam or a prep course for it, it's not like those multiple choice exams or online "talk to a screen" exams that claim to be able to determine a candidate's language ability. For the speaking portion of the IELTS exam you sit in a room with the examiner and basically have a conversation for 11-14 minutes. Some parts of the exam are scripted but the examiner has some flexibility for where they can take the conversation. Scoring is spread across the candidate's lexical resources, grammatical accuracy, pronunciation, and fluency & coherence. Scores for each criteria are 0-9. When you look at the descriptors for each band there is a quite a bit of wiggle room. Sometimes the difference between a six and a seven for one criteria is a "feel thing". This is where attitude/passion/personality/enthusiasm/energy level comes into play. A candidate's attitude won't change their grammar mistakes but it can shape the way we hear them speak. The examiner may feel like the score for vocabulary usage, pronunciation, and fluency could go either way and if we actually enjoyed talking with the candidate we will probably skew up. I know this has happened to me in the past. "Six? Seven? Six? Nah, they were really confident... Seven!" A second example comes from the presentation skills classes I taught in the EFL department of a university in Korea. Listening to ten or more presentations in a row can be tedious. Students who began their presentation with a strong voice and a smile on their face changed the dynamic of the entire room. I would often glance around at the beginning of each presentation to see if the other students were paying attention. If the speaker began with a weak, flat voice, many of the students would put their head down and study their notes for their own presentation. Conversely, a strong voice provoked the others to pay attention. It was almost as if the other students knew they could learn a thing or two from this speaker. When giving post-presentation feedback, I regularly pointed out how impressive the speaker's energy level was and how it helped me give the speaker my full attention. Most of the students nodded in agreement but it wasn't always easy for them to emulate. This leads us to the third example, conference speakers. Like in my class, many speakers at ELT conferences are non-native. Many of them confess that it can be intimidating to give a presentation to their colleagues, especially if there are native speakers attending the talk. I suppose it's human nature to assume you are being judged when giving a conference presentation. I'll confess, in my case you are being judged, just not the way you think. I can't help it. I judge every speaker's presentation skills. I judged Jane Goodall when she came to give a talk about her years in the mountains with the chimpanzees. I judge big name speakers who come to conferences and give the same uninspired talk they gave a week ago in a different city. And I just the language school teacher who is giving their first presentation at a conference and is scared to death. The thing is, I'm not judging their English unless it is so bad that I can't understand what they are talking about, and that almost never happens. So speak with confidence. Believe in your message, believe in your content, and believe in yourself. There's something special about a speaker who seems genuinely happy to be there. They know they have an accent (which is not a bad thing), make occasional grammatical errors, and say the wrong word from time to time but they are there to share something of value and that's what they focus on. You can see the joy on their face and if you look around you will see that joy reflected in the faces of the audience members. So, I'll end with the same advice I gave in my reply to the DM on Twitter. "Accuracy takes time to develop. Sometimes it never develops to where we want it to be, but energy and enthusiasm can make up for that. If she brings passion to the presentation, it can often overcome the inaccuracies. If she appears to lack confidence AND makes a lot of grammatical errors, it wouldn't be surprising for the client to say no. Have her practice timed answers for surprise topics that require her to share her opinions. Praise her for passionate answers. That should help in the short term." Writing articles for magazines that focus on language teaching can be great for your teaching career. It boosts your CV, enhances your name recognition which will generate opportunities at professional development events and conferences, and best of all it helps other teachers. So what do you need to do to get your article published in a language teaching magazine? The first thing to do is select the publication you are interested in writing for. What kinds of articles do they publish? How long are they? How are the articles laid out? Are they more academic and research based or are they more about sharing thoughts and classroom experiences? Do most of the articles have a long list of references? Make sure your topic is something that fits within the magazine's scope and isn't repeating something that was published recently, then read the submission guidelines carefully. This is a tip I give to anyone writing for publication, whether it is a letter to the editor in a local newspaper or a scientific journal article: Make sure your manuscript looks like articles that have been successfully published. This means the length, the tone, the format, and even style choices like serial commas and British/US spelling. If the format doesn’t match the editor’s expectation, it’s probably going to be rejected unless the content is so good that is makes up for it. Even then, the editor is likely to ask for revisions. Think about who will be attracted by your title and read your article. Does the title accurately portray the benefits your article is offering? Your reader will most likely be a less experienced teacher or a teacher who is interested in new ideas for their classes. Focus on sharing what worked for you and make sure you clearly lay out what the reader will need to do to duplicate your success in their classes. Explain your teaching situation so the reader can determine if they will need to make any adjustments to implement your ideas. It is very hard for me to start writing without planning what I want to say. I need to outline my thoughts on paper (yes, actual paper) and make sure I have a clear plan for what I want to share and enough content to make it worthwhile. I try to assemble my main points or tips as bullet points and find a way to make them flow together. Writing from an outline also allows me to focus my concentration on clearly explaining my ideas for each subsection instead of being distraction by trying to make sure the whole article is tied together while I’m writing. It is important not to rush and fire off your first draft. Put it away and look at it again after a day or two (or seven). Try to absorb the article with fresh eyes and imagine that you are someone who is trying to learn from it. What might not be clear to someone who is new to your topic? What could explained more succinctly? Is your tone consistent? Ask a colleague to look it over and give feedback. Hopefully they will also catch your typos. Thanks, Michael F.
I usually keep my submission emails short. In fact, they are rarely more than three sentences but the one I never leave out is the one that explains how I feel the article can benefit the magazine’s readers. I find that this helps the editor approach the article with a more positive attitude. This has been the case for me both as a writer and an editor. It feels great to see something you wrote in print or published on a popular website. I have had good luck with magazines like English Teaching Professional, Modern English Teacher, EFL Magazine, and KOTESOL’s The English Connection. Regular publications are always looking for new content so if you have a creative idea to share with your fellow educators, follow these tips and you should see your article in print in no time.